In 1966, armed with an unmatched work ethic and a dream, Jim and Helen Nikolis opened Jim's Pizza at 16 Poquonock Avenue in Windsor. In the following 34 years, Jim and Helen and their family, along with a great staff and loyal customers, built a truly great family restaurant that moved to its current location in 1978. Feeding generations of Windsor residents and families, Jim's also became an integral part of the Windsor community, supporting events, sports and causes too numerous to name. 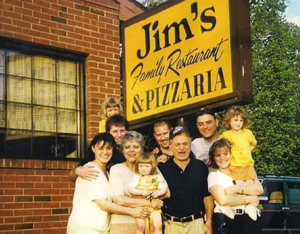 Remaining owners of the building to this day, Jim and Helen and their family are proud and excited to return as the owners and operators of Jim's Pizza. We look forward to welcoming you back and returning Jim's to the high standards set for decades. For a quick lunch, family dinner, corporate outing or any banquet or party needs, we look forward to hosting you soon. Thank you so much for your support along the way and in the future. Two years ago, Jim and Helen's daughter, Pamela, took over the management and resumed the Nikolis Family's ownership of Jim's Family Restaurant & Pizzeria. Stop in and give us a try!